Over the weekend, this video of a ginger kitty using its best kung fu panda moves on a singing birthday card went viral, but it isn't the first time the meowing greeting totally ruined a tabby's day. Click here to take a look back at 9 more examples of cats (plus one baby) versus the same musical card, that I compiled back in 2010. 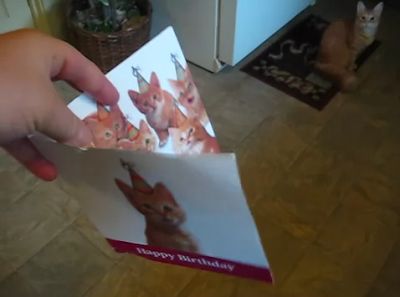 Those videos are too cute of those kitties attacking the singing card. I want to buy one but I betcha the cats here run for the hills. Take care. Locketship Persian Cat Ring Giveaway Winner! Locketship Persian Cat Ring Giveaway! Your New Favorite Cat Movie: "Miss Minoes"